A lot of companies say they function as a family. 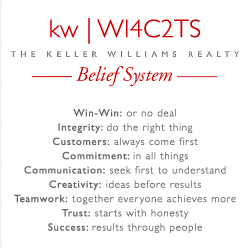 At Keller Williams Realty, we place such an importance on this that we have designed a culture that fosters this. This approach guides us every day in how we conduct our business. Mo Anderson defines the culture of Keller Williams Realty as “living the mission, vision, values, beliefs, and perspectives" of Keller Williams Realty. Our beliefs are the rules we live by and they dictate how we work together and will treat each other.